Like everyone else, I was horrified by the events in Paris on Friday night. 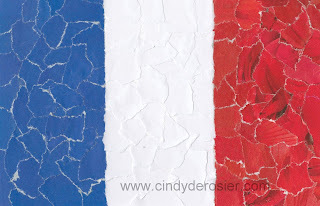 I decided to make a mosaic of France's flag in the same style as my United States flag mosaic. It took about 20 minutes from start to finish. I started with a little research about the French flag. I was curious about the symbolism and history of the flag, plus I wanted to make sure I got the proportions correct. Armed with knowledge, I got started. 1. Cut the cardstock into a 7.5" x 5" rectangle. Draw vertical lines at 2.5" and 5" to divide the paper into equal thirds. 2. Tear pages from magazines that have solid areas of blue, white and red. Finding white is not a problem. It's all over the place. Blue is fairly common in photos (blue skies, blue water, etc) and advertisements. Red is tougher to find in large enough areas to use. Knowing this, I went straight for a gardening magazine that happened to have an article about red in the garden. If you look carefully at my reds, you can see the variegated petals amongst the pieces. 3. Spread glue in one section. White glue works well, as does a glue stick. Tear the magazine into pieces about the size of your thumbnail and place them into the wet glue. Overlap them as you work and let the pieces hang off the edge somewhat. You'll trim those later. Avoid using the edge pieces from the magazine. Straight lines amongst the otherwise-random shapes in the mosaic really detract from the overall look. 4. Repeat the process with the other two sections. 5. When the mosaic is dry, trim the excess magazine bits off the edges. 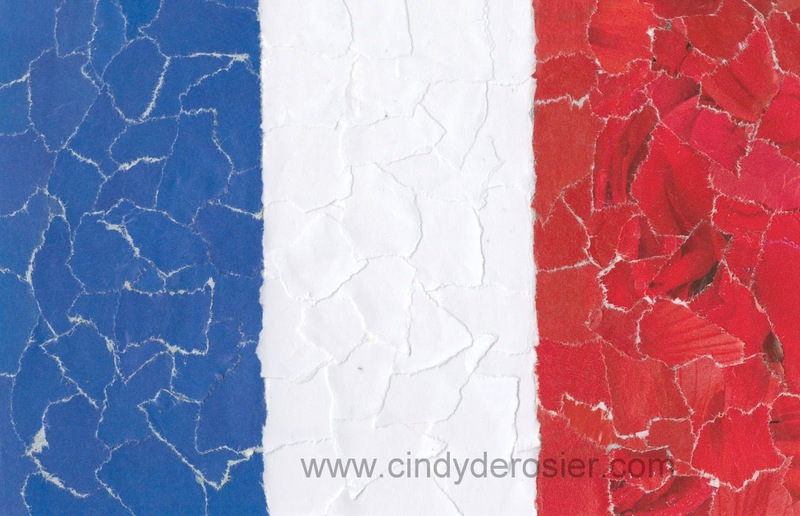 Prayers for France and prayers for the world. Your mosaic turned out great...you have a lot of patience.